Lupus is a chronic inflammatory disease that can affect various parts of the body, primarily the skin, joints, kidney, and brain. The disease affects the immune system, causing it to become hyperactive. Normally the system makes proteins (antibodies) in order to fight antigens (viruses & bacteria). Lupus causes the immune system to confuse the antigens and healthy tissue, attacking and killing both. This leads to chronic pain, swelling, and long-term tissue damage. Systemic Lupus Erythematosus (SLE) is the most common form of the disorder that largely affects the skin, joints, kidney, and brain. While the disease occurs in multiple forms, this version of the disorder is referred to as, “systemic,” because it affects multiple organs. A localized autoimmune disease, like type-1 diabetes, affects only one organ. The main complication of this version of the disease is inflammation, which occurs in the CNS, brain, kidneys, and blood vessels. Some patients with SLE develop abnormal deposits in their kidney cells, which tend to cause kidney failure. The condition, Lupus Nephritis, typically results in dialysis or a kidney transplant. Several patients suffer from a version of the disorder that exclusively affects the skin, called Cutaneous Lupus. They typically have swollen lymph nodes and a distinguishable scaly, red rash on the cheeks and bridge of their nose known as the butterfly rash. This version is also known as Discoid Lupus because the rash is circular in shape, like discs. One form of this disease that is particularly interesting is known as Drug-Induced Lupus. Cases have been reported where Lupus-like symptoms occur as a result of adverse reactions from certain legal prescription drugs. The condition has been linked to a hypertension medication called Hydralazine, a heart arrhythmia medication called Procainamide, and Isoniazid, a medication used to treat tuberculosis. However, according to Medical News Today, “there are some 400 drugs that can also cause the condition.” They claim the majority of symptoms typically subside after the medication is removed from the patient’s prescription. Neonatal Lupus is a rare version of the disease that affects children of women who suffer from the disorder. The temporary symptoms are caused by antibodies in the mothers’ womb acting on the infant, and typically disappear within a few months. The infants tend to develop skin lesions, low blood counts and liver problems in the first few weeks of their life. However, most children of mothers with lupus turn out completely healthy, and physicians can now treat children at birth if the parents are concerned. While the main cause of Lupus remains unknown, it is most prevalently seen in women between the ages of 15 and 45, and more severe cases are typical in African-Americans and Asians. It is thought by some to be passed on genetically, although no one gene has been identified as the perpetrator. Despite that fact, lupus does tend to appear in families, especially in twins. Others believe it is caused by a number of environmental factors. These can include stress, over exposure to ultraviolet light (mostly sunlight), smoking cigarettes, chemical exposure (from well water and dust), infections, medications, and prescription drugs. Everyone that suffers from SLE experiences some type of joint pain or swelling, and some develop arthritis. Several Lupus patients experience “flares” where symptoms develop suddenly and are temporary, or “remissions” where they subside. Since there are several versions of the disease, no two patients will have identical symptoms. Despite that fact, a majority of people who suffer Lupus only experience symptoms in a few organs. Causes blood clots in patient’s legs (Deep-vain Thrombosis) and lungs (Pulmonary Embolism), as well as increased risk of anemia. It causes fluid to build up around the lungs (Pleural effusions), and heart (Pericarditis), causing inflammation and critical damage to heart & lung tissue. Destroys red blood cells (Hemolytic Anemia). A low blood supply to bone tissue causes bone death, which typically occurs in the hips of Lupus victims. While lupus is not a terminal disease, it is chronic which means there is no cure. However, symptoms can be managed to improve the patients’ quality of life, and most people with lupus live a normal lifespan. While there are medications used to treat lupus, often times they bring about horrible side effects, which are combated with additional prescription medicines such as Prilosec ®, Prevacid ®, and Cytotec ®. Cannabis is considered an ideal medication to help Lupus patients cope with the symptoms of the disorder like nausea and pain. It’s also known to be an anti-inflammatory, suppressing certain parts of the immune system. Dr. Sean Breen is the medical director of Medical Cannabis of Southern California, one of the most professional medical marijuana clinics in the industry. Their extremely professional staff is dedicated to serving the community by evaluating patients who may benefit from the use of medical marijuana. Dr. Breen has evaluated tons of patients who suffer from rheumatoid arthritis and lupus. One woman in particular had been suffering from the side effects of the Plaquenil she was taking to limit her joint inflammation and swelling. While the drug worked great, it was causing her, “debilitating abdominal cramping, nausea and occasional vomiting.” She spoke to a friend who treated her own lupus arthritis with cannabis, and was convinced to try some to see if it would help. According to Dr. Breen, she reported her abdominal cramping and nausea had subsided. Also, her joint pain has significantly improved with no noticeable side-effects. He states in his article on MCSocal that he has recommended she try vaporizing an indica strain at night to help with sleep, and a topical cream during the day to treat joint pain. The patient claims that she will most likely never stop using cannabis, as there is no permanent cure for arthritis (aside from joint replacement). 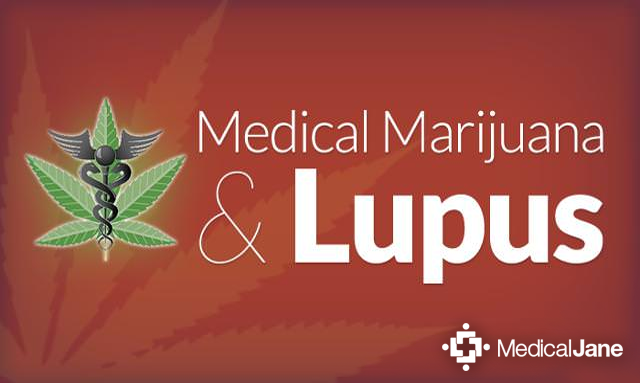 There is no doubt that cannabis has some medicinal benefits, and helps patients to cope with symptoms of Lupus. On the contrary, medical cannabis is only legal in a number of states. The naturally grown “drug” remains illegal on a federal level, so one should consider the law and its consequences before deciding to self-medicate. Even if you live in a state where cannabis is legal medicinally, always consult your doctor before using cannabis to treat your condition.